We learned earlier today Teresa Palmer is in talks for the female lead in the Point Break remake. The timing is crucial, since production is scheduled to begin June 26. Gerard Butler dropped out just last month, but producers soldiered on and cast Edgar Ramirez in his place. Ramirez makes that bit of serendipity sound like the best thing that ever happened to him, calling the experience “pure magic.” We recently spoke to Ramirez to talk about his new film Libertador, and he was happy to talk about sharing his love for the original Point Break with Kathryn Bigelow, keeping the subversive aspect and protecting the legacy of the original, and his appreciation for the international cast. Ramirez plays Bodhi (the Patrick Swayze role) in the new Point Break, set in the world of international heists and extreme sports. We’ll post the full Edgar Ramirez interview down the road—read what Edgar Ramirez had to say about Point Break after the jump. Collider: I have to ask you about the Point Break remake. Is that something you were fan of going into it? RAMIREZ: Always, I cannot believe that I’m making that movie. It’s almost magic, the whole thing. 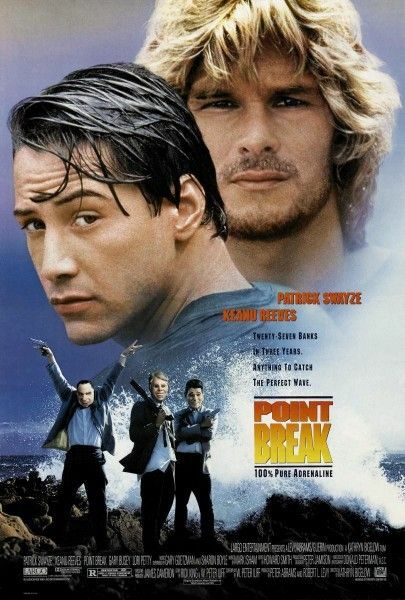 I remember I would always joke among my friends about a remake of Point Break. I would say, “You know what? Whenever there’s a remake of Point Break, I’m going to do it.” But since it’s such a California movie, and especially the role of Bodhi was such a California rooted character, I thought I would not be the first choice for it. Then the fact that the movie was offered to me, because it’s taking on a world scale, and it’s precisely Bodhi, the character that I always wanted to play. I remember when I first met Katherine Bigelow for Zero Dark Thirty—actually we met for another movie and that never got made, and then she called me and invited me to Zero Dark Thirty. I remember when we first met the first thing I said was, “You have no idea the magnitude of the influence that Point Break has had on me and my friends and my generation,” and I went on about how much I love it, and what I know, and all that. Then suddenly making that movie now, it’s pure magic. I’m very, very happy. I’m very happy, because we’re not going to copy the movie, it’s a different story, but it keeps the subversive aspect—the subversion, the anti-system, the breaking out, the breaking free spirit of the first one; that’s what we’re going to try to definitely be faithful to that spirit—that you can take charge, that you can be in control, that you can think out of the box and you can reject the system and try to live on the grid, but on your own terms. So that’s pretty much the spirit, but it’s definitely not going to be—it is a remake in the terms that you have Utah and you have Bodhi and you have that spirit, but it goes beyond surfing and it’s a story that happens in today’s time. So I’m the first huge fan of Point Break and of course I will make sure that I protect it’s legacy. Awesome. I can’t wait to see it. Do you know when you start production and begin shooting? Oh my goodness, it’s right upon you. RAMIREZ: Yeah, right upon me. I can’t wait to see some footage. RAMIREZ: Oh my god, I’m so excited. I just came back from Germany where we’re doing all the rehearsals and preparation, and I love the group of guys put together; people from all over the world, from Sweden, from Germany, from Norway, from Australia, it’s fantastic, from Venezuela – me. I’m very happy. Click here for all our coverage on the Point Break remake.